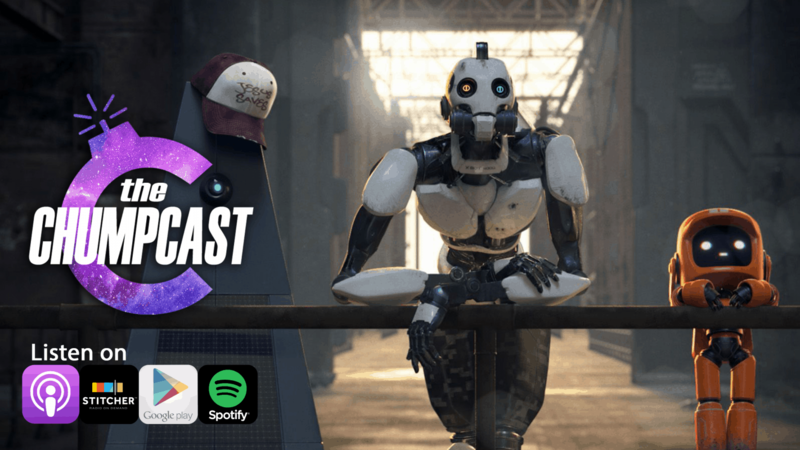 Welcome to episode 136 of The Chumpcast! Brick is making his move to Colorado, so let’s all pile on and make fun of him. In celebration of his departure, we’re going to draft our favorite episodes of Love, Death, and Robots from Netflix. Thanks to our friends at Family Video for sponsoring the show. If you collect DVDs or Blu-Rays, you can get some awesome deals through our family video portal. They have great deals on new releases and they’re always updating their selection. I’m looking right now at copies of Creed II, Wreck It Ralph 2, Bohemian Rhapsody, A Star is Born, and way more all for under ten bucks. Plus, it helps your Chumps. If you want more fresh content before everyone else, check out patreon.com/thechumpcast! You can find us on all social media platforms @thechumpcast. You can also call or text us at 847-920-6107. If you leave us a good enough voicemail, you might hear your voice on a future episode. If you’re looking for merch, you can check out our website, thechumpcast.com You can also support us by using our Amazon Affiliate link, thechumpcast.com/amazon.If you like us, tell a friend! Subscribers help us grow and bring you more of the content you love. We also appreciate ratings and reviews on iTunes.